Looking for a job in Kankakee County Illinois? This Kankakee County Illinois job guide is a resource for job seekers looking for legitimate employment opportunities in the region with an emphasis on government positions, top healthcare employers, public school careers, and major job boards. Kankakee County Illinois periodically posts job openings. Open positions found on this review date had included Maintenance Mechanic, Court Clerk, Client Service Representative, Public Health Nurse, Sanitarian (Environmental Health Inspector), Licensed Practical Nurse LPN, Registered Nurse RN Case Manager, RN Pediatric Nurse. Check for updates. Kankakee County Sheriff's Office hires for the positions of Deputy Sheriff and Correctional Officer. Only cities that have human resources pages are listed below. 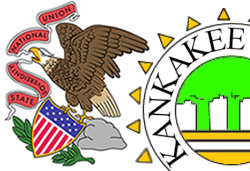 The City of Kankakee had been hiring for the positions of Full-time Clerk and Secretary on this review date. Check for current listings. The City of Momence may periodically post employment listings. The Village of Bourbonnais appeared to have employment listings. Some jobs found included Assistant Public Works Director and Code Enforcement Officer. The Village of Bradley had been accepting applications for the position of Firefighter. Other career opportunities are posted as vacancies become available. Check the Village of Manteno's employment page for current listings. The Bourbonnais Township Park District periodically posts parks & recreation related jobs and support staff positions. Note: Healthcare employers and schools are listed lower on the page. CSL Behring offers a wide range of ongoing career opportunities in Kankakee. If you are seeking a position in a values-driven culture where you can make a positive impact on the lives of people who use our products around the world, view our job opportunities to learn more about the roles available with CSL Behring. Available positions found on this review date had included Refrigeration Repair Service Technician, Appliance Consultative Sales Associate, Home Improvement Sales, Small Engine Repair Technician, Backroom Associate, Mattress Sales, Maintenance Manager, General Warehouse Associate, and Skilled Maintenance Associate. eddinghaus Corporation is the acknowledged global leader in CNC machine tool technology for the structural steel and plate fabrication industry. Here you may find openings such as Entry Level Material Handler / Laborer, Panel Builder, Buyer, and Service Technician. BASF is the second largest producer and marketer of chemicals and related products in North America. AAF Flanders is the world's largest manufacturer of air filtration solutions. rown Holdings, Inc., through its affiliated companies, is a leading supplier of beverage packaging, food packaging, aerosol packaging, metal closures, and specialty packaging products to consumer marketing companies around the world. VanVoorst Lumber Company and Vanfab Inc. is a family operated wood and metal fabricating company specializing in industrial products for commercial applications. IKO Midwest Inc. was hiring for positions in Kankakee during this review. Some jobs found had included Maintenance Mechanic, Process Engineer, Industrial Electrician, and Electrical Engineering Technologist. Van Drunen Farms produces a large variety of herbs and vegetables with no external sourcing and unmatched quality. Fresh Del Monte Produce, Inc. is one of the world's leading vertically integrated producers, marketers and distributors of high-quality fresh and fresh-cut fruit and vegetables, as well as a leading producer and distributor of prepared fruit and vegetables, juices, beverages, snacks, and desserts. Baker & Taylor is the world's largest distributor of physical and digital books and entertainment products, as well as value-added services to libraries, educational institutions and retailers. Employment listings had included Shipping Clerk, Sorter, and Receiving Clerk. Riverside Medical Center is a 312-bed hospital that provides a full scope of inpatient and outpatient care. Open positions found had included Memory Care Experience Associate, Senior Living Communities Nurse Coordinator, Rehab Services OP Occupational Therapist, Behavioral Health Therapist I, Patient Care Assistant (CNA) Bourbonnais Campus, Radiation Therapist, Radiology Diagnostic Tech, Medical Surgical Certified Nursing Assistant, Housekeeper, OR Perioperative Aide, Licensed Practical Nurse, Personal Trainer, Dietary Aide, Group Exercise Instructor, CHC Registered Nurse RN - Bourbonnais Primary Care, Diabetes Educator Registered Nurse RN, Certified Nursing Assistant CNA, Housekeeper, CTC RN, Senior Living Communities Lifestyle Care Coordinator LPN, Yoga Instructor, Family Medicine Physician, Massage Therapist, Swim Instructor - Lifeguard, Ambulance EMT Paramedic, and Rehab Services OP Occupational Therapist. The Shapiro Center serves as a residential and training center for people who have an intellectual disability. Hiring is done through The Illinois Department of Human Services IDHS, and specifically, listings are found on work.illinois.gov. IDHS is comprised of more than 13,200 employees in offices Statewide where, at any given time, job opportunities might be available. Amita St. Mary's Hospital Kankakee had a high volume of employment opportunities on this review date. A survey of listings had included Certified Nursing Assistant CNA, Dialysis Tech, Environmental Services Worker, Emergency Room Tech, Staff Nurse, Emergency Room Tech, Computerized Tomography CT Technologist, Nursing Assistant, Registered Respiratory Care Practitioner, Clinical Staff Pharmacist, Home Health Aide HHA, Lead MRI Technologist, Pharmacy Tech, Staff Nurse RN, Food Services Assistant, Patient Care Technician Med Surg, Licensed Practical Nurse LPN, Manager Pharmacy, Nuclear Medicine Technologist, Registry Pharmacist, Security Officer, Switchboard Operator, Food Services Assistant, Clinic Nurse Oncology, Mammography Technologist, and Staff Nurse RN Emergency Services Sign On Bonus. Cigna Healthcare had at least one location in Kankakee County. A review revealed a minimal number of jobs, but a good employer to visit periodically. Manteno Veterans' Home is located east of the city of Manteno in Kankakee County. Hiring is through the Illinois Department of Veterans Affairs with job listings found on Work.Illinois.Gov. Check for listings. OAK Orthopedics openings found had included Credentialing Specialist, Coding Specialist, and MR Tech. River North of Bradley offers an individualized approach to nursing care, hospitality services and amenities. Athletico Physical Therapy provides competitive and flexible benefits. Positions may include Rehab Aide, Physical Therapist, Athletic Trainer, and Occupational Therapist. Kankakee School District 111 hires teachers, administration and support staff. Here you may find employment opportunities such as Head Start Teacher, Track Coach, Baseball Coach, Preschool Teacher, Math Teacher, Interventionist, Teaching Assistant, Art Teacher, School Custodian, Special Educational Paraprofessional, Family Support Specialist, Band Director, Reading-Math Interventionist, Language Arts Teacher, Pre-K Paraprofessional, Custodian, School Nurse, Special Education Teacher, Cafeteria Helper, Cafeteria Helper, Custodial Jobs, English Teacher, Paraprofessional, ESL Teacher, Foreign Language Teacher, Crisis Intervention and Program Stabilization (CIPS) Teacher, Kindergarten Teacher, Teaching Assistant, Gifted Teacher, 7th & 8th Grade Math Teacher, School Psychologist, Clerical Substitute, 1st Grade Bilingual Paraprofessional, School Social Worker, Library Aide, and more. Bourbonnais School District 53 had openings for Reading Tutor, Bus Driver, Bus Driver Aide, Substitute Nurse LPN, Custodian - On Call, Substitute Bus Driver Aide, Substitute Teacher, Playground Supervisors, and Teacher Assistant - Special Education. Check for new listings. Bradley Elementary School District 61 is a part of I-KAN Area Schools. Grant Park Community Unit School District 6 lists Educational Vacancies, Extra-Curricular Vacancies, and Support Staff Vacancies. Herscher Community Unit School District 2 had open positions for 7th Grade Baseball Coach, Full Time Paraprofessional Jobs, Food Service Cashier, Kindergarten Teacher, Non-Certified Substitute, Substitute Teachers, and RTI Paraprofessional. Manteno Community Unit School District 5 has ongoing employment postings. A survey of listings on this review date had included High School Baseball Head Coach, Cheerleading Coach, Substitute Custodian, Title I Reading Teacher (K-4), Business Teacher, High School Special Education Teacher, Middle School Language Arts Teacher, Substitute School Nurse, Special Education Teacher, Instructional Paraprofessional, School Social Worker, Speech Language Pathologist, Library Media/Physical Education Assistant, and Substitute Bus Driver. Visit Momence Community Unit School District 1 for current employment listings. Kankakee Community College provides a stimulating and rewarding work environment. Faculty, administrative and support staff positions become available periodically so you are encouraged to visit often. Olivet Nazarene University provides employees a faith-based, supportive community where they can find purpose in their work, as well as life balance. Illinois Education Job Bank provides listings for Instructional, Administrative, Non-Certified Support Staff, and School Service Personnel in various Illinois school districts. KCC offers high quality, cost-effective work force preparation services through The Workforce Innovation & Opportunity Act (WIOA). For more information, call 815-802-8963. The primary purpose of the Kankakee Area Career Center is to meet vocational / technical education needs of the regional high school students. The underlying function of the career center is to prepare students to select viable career paths and to obtain the training and skills essential for continuing education and/ or the job market. The Daily Journal Kankakee Classifieds Jobs section provides jobs sorted by category or that can be searched. Monitor the State of Illinois web-based electronic hiring system for job openings in Kankakee County. This Worklooker directory includes Presence Saint Joseph Medical Center, Plainfield Community Consolidated School District 202, Silver Cross Hospital, Wolfe Behavioral Health, University of St. Francis, Will County Sheriff's Office, and more. This Worklooker directory includes East Chicago, Whiting, Hammond, Community Hospital / St. Catherine Hospital, Gary Community School Corporation, and more.